Garlic scapes are the flower stalks of the perennial garlic bulb. Garlic scapes are both edible and delicious, used as a substitute for garlic until garlic is harvested. Strong, pungent taste, scapes can be sauteed lightly and used over pasta, mixed green salads, pesto, in any dish that would be complemented by garlic. 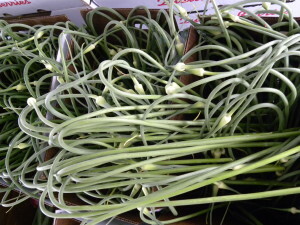 Garlic scapes are a short season crop and can be frozen for later use.